The Nigerian Army has dismissed close to 200 soldiers, as a result of their cowardice in tackling the Boko Haram insurgents terrorising communities in the nation’s north-east. The Army said on Tuesday at the Rukuba Barracks in Jos, the Plateau State capital, that the militias were dismissed due to their negligence of duty. The dismissal is coming months after the military increased counter-terrorism operations in the north-east, chasing the terrorists, trying to establish an Islamic State, out of communities they had earlier occupied. Troops of the Nigerian Armed Forces in collaboration with neighbouring countries armies have also made remarkable breakthrough in their efforts to dislodge the terrorists from their Sambisa Forest stronghold. Last week, some 260 women and children rescued from the Boko Haram terrorists’ stronghold, Sambisa Forest, were relocated from a camp in the North-eastern city of Yola to an unspecified military facility. 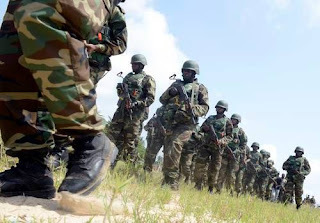 The Nigerian troops fighting the terrorist group had also inflicted another crushing defeat on the Islamist militants at the Sambisa Forest, in a major offensive described as ‘merciless’ against the insurgency. The Nigeria Army then warned that the army would not condole any act of cowardice, neglect or indiscipline from any of its personnel.